It’s done. Finished. Over with. Gone. Four years after setting out to eliminate our mortgage and create flexibility in our lives, we’ve accomplished our goal! This was the very last of our debt, so we are officially debt-free now (well, the first stage at least). Over the last 12 months I’ve been working 2 extra jobs for several reasons, not the least of which is paying our mortgage off as quickly as possible. The money I’ve been earning moved our payoff date up from next summer to December 31st, which was awesome. 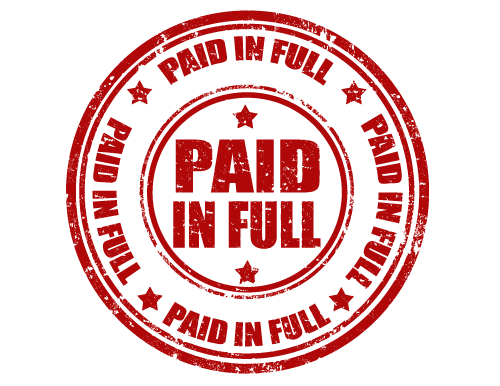 Then one of my clients sold a website that paid totally up front, which was plenty to move our final payment up to December 1. Since I had the time on black Friday, and the bank was open, I decided to head over there and take care of wiring the funds (which is a ridiculous requirement, but whatever, it’s done). I sat down across from the account manager, told him my plan, and handed him the wiring instructions. “OK”, he says, “let’s pull up your account and get started”. I decided not to say anything except for “Not today, thanks”. I paused. “I’m very sure”, I answered. “Tis the season, though.” He laughed, and agreed. Once I had squashed his potential sale he decided to be nicer, and actually complimented me on paying off our mortgage at such a young age. It really was a glorious feeling, knowing that this would be the last time I would have to make payments on my house. It also means the end of moving roughly $2,000 a month out of our checking account, so our income requirements for next year will be much lower. That’s very possible, and I’m very happy with that.